Linda Goldstein Knowlton adopted her young daughter from China. She wants to provide her daughter with a culturally sensitive upbringing, and to do this she has sought out the stories of several young women who were adopted into the United States from China. One of the adoptees referred to feeling neither completely Chinese nor completely American, nor Chinese and American, but as a child stuck somewhere between two countries. 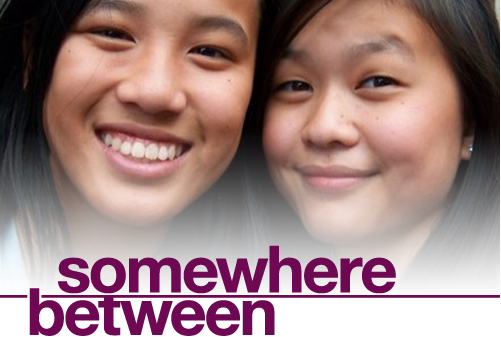 Somewhere Between is a documentary which focuses on the stories and experiences of four teenagers. Somewhere Between directly relates to the international adoption of girls into the United States from China. It also focuses on issues relevant to all adoptions – issues of identity, birth family issues, reunification, birth family’s reasons for adoption, and issues of finding community connected to adoption. There’s a lot of good in this one. Linda provides an excellent model for a parent adopting cross-culturally. She acknowledges that her daughter “will have so many questions that I won’t be able to answer.” She asks, “How will I help her build a strong sense of identity when there are so many missing pieces?” Then, committed to striving to meet her daughter’s needs, Knowlton reaches out for information and finds community. She’s not afraid of admitting what she doesn’t know, and isn’t willing to make excuses to continue not knowing. The adoptees interviewed have processed their adoption differently, but all seem to be thriving. One adoptee seeks for – and finds – her birth family, and is able to learn the story of her adoption from their perspective. It is both a particularly sad story and yet the meeting seems to provide healing. The adoptee is given a Chinese name by her birth father, which is particularly meaningful to her. Adoptees are advised to seek out their siblings as soon as possible, because records are lost, and that could render reunification much more difficult. Adoptees confront stereotypes they face as persons of Asian origin. Adoptees assert that they were not overlooked by God. In a companion documentary packaged with Somewhere Between, we see how differently people can process adoptions. For some, it’s a primary identifier; for others, it’s part of their identity, but they view many other identifiers as more central to their self-concept. The concept of “color-blindness” is challenged, and one adoptee makes the point that culture and race are unique from each other, and that both are important in a person’s experience of life. It could be painful for some viewers to be confronted with the film’s portrayal of way in which females are differently (and perhaps less) valued in China than males. A common theme is that the girls were relinquished because of their gender. In one community, women are not allowed to be taught written language. Somewhere Between seems well-loved by many in the adoption community. Angela and Bryan Tucker from Closure suggested it as a resource for families wanting to expand their understanding of crosscultural adoption. Some of my colleagues have also recommended it to me. After watching it, I immediately shared it with the social workers that I supervise. There’s so much good material for thought and conversation in Somewhere Between. It seems like a good fit for all adoptive families, especially for adoptive families who have adopted girls. The issues of identity, reunification, and wondering why they were relinquished are important to many people touched by adoption. Parents who have relinquished a child to adoption may see their own grief reflected in the grief of the birthfather shown in this film; like the reunion in the film, the film itself could be both painful and conducive to healing. When someone is adopted, do they become fully part of the adoptive family? Do they remain part of the birthfamily? Are they fully both? Or are they somewhere between? Which story did you resonate with the most? Would you be open to reunification during your child’s teenage years? Earlier? I am adopted and I found my birth-Mom. It was difficult for my Mom to accept that I even WANTED to find my birth-Mom. (She felt is was disrespectful to her.) My Dad seemed to support it, but, I'm not sure he was 100% into it and perhaps after I found ONLY my Bio-Mom (my Bio-Dad is deceased prior to my birth) he was relieved to not have to feel he was going to be ""compared"", as my Mom put it to another ""parent""
From my Bio-Mom's side of things, she was always thankful, yet scared to meet my Mom. Thankful for what she provided to me as a baby and into my life but scared to see the person she felt ""did the job"' she said she was "'ill-prepared to do"". So, to answer your question are they part of the birthfamily or fully both or somewhere in-between. I think, once found and IF accepted there is a very deep, intensely and strangely deep sense of not knowing precisely where you lean.. For me, I loved talking to my birth-Mom all the time, we had QUITE the relationship on the phone..we sent tons of letters and cards and emails.. we saw each other a few times per year for the 7 years until her untimely and very sad death. Those times, in person.. there seemed to be a type of strange anger or agitation that occurred from BOTH of us.. we could never place it..it's like we were trying SO HARD to make us for lost time.. do things we thought we ""should have been able to do or share"".. there were time of GREAT PEACE and great distress.. I think reunification is absolutely something one MUST DO in life.. I don't consider it an option.. it CHANGED MY LIFE.. it helped me to understand SO MUCH about who I am ... it literally.. completed me in a way I cannot explain. Thanks for sharing your experience, Tracy. It sounds like your reunification led to some tough moments and some very excellent moments, and that even though the experience was mixed and sometimes confusing, it was definitely, definitely worth it. I'm glad you chose to share this!